Day 557 - Friday and Off to Newport! Yes, that's right - we're heading to Newport, RI, land of the rich and famous (except for us vacationers who just wish we were rich and famous). I am all re-packed, and less carefully than my original packing job, since it won't be going on a plane. Favorite things - Panera Bread, Yesterday's restaurant, Opera House Cinema, the Harbor tours, Ben and Jerry's waffle cone sundaes, etc. Tomorrow we'll be heading to the Nordic Lodge - www.nordiclodge.com for all you can eat lobster, king crab, prime rib and filet mignon... Be still my heart (and my intestines). I don't know when I'll be able to write another blog entry, not for a week unless they have an internet setup where we're staying OR Charlie and I walk up to the library. TTFN and use the comments to chat among yourselves! A week ago today I started my vacation! Time flies when you're having fun. No good dreams last night to tell about, at least no dreams that I remember. Yesterday's trip to the Chick-a-dee restaurant was very fattening and very delicious. We ordered fried clams in batter (you can also choose them fried in crumbs), onion rings, hot dinner rolls, and lobster stew. Desserts - I had bread pudding and Gil had pecan pie, both topped with homemade whipped cream. My mother 'helped' us eat them. We also stopped at Dunkin Donuts later in the day, I had an orange Coolata - kind of a frozen slushy drink. Red Sox vs. Yankees game 2 last night. The Sox lost again. Sheesh. Good thing I didn't buy a t-shirt. My mother and I will do more shopping and more laundry today - those are things you need to do even when you're on vacation. Yesterday was the first day my mother didn't see anyone she knew to introduce me to. (She knows I'm going to write about this.) I am a living, breathing, walking 'show and tell' item during my visit. Even the poor convenience clerk at the local 'Handy Store' had to hear who I am, where I live, how long I'm staying, that Charlie is flying in on Friday, and the general agenda for my visit. Guess I'd better get going, the sun is up and it's all of 56 degrees outside! Have a nice Thursday and TOMORROW IS FRIDAY! TTFN! Can it be Wednesday already? Jeepers! Tomorrow will be a week already since I left on vacation. It doesn't seem possible. I want vacation to go by more slowly! Breakfast out yesterday was great, and the popover was awesome - as big as a softball and delicious! The western omelette I had with it was good too, but the popover was my favorite part. I can safely say that was the first popover I have had with breakfast! Let me tell you my dream from Monday night. I was on some kind of opulent, luxurious aircraft, with freeform oversized seating, and fancy furniture like entertainment centers, bookcases, etc. The plane was in trouble, and was spiraling down but I don't remember feeling that it was going to crash, just be a rocky ride. I walked around preparing the chairs and furniture's stability - though I wasn't an employee. The furniture had anti-tipover 'feet' that pulled out from the bottom so the furniture wouldn't topple over. The chairs had footrests that I was also pulling out, and the footrests had faux-fur-covered inserts for your feet so you could slip your feet into them like slippers. When I woke up - my feet were cold, so I think that is the reason my dream was so 'footing' centric. It was around 50 degrees outside. My mother and I were driving in her car. We got to a section of the road that was covered with sparkling water, and we drove right into it. When we were floating, merged into the line of cars and trucks - the 'traffic' in the water. There was lots of floating traffic taking this 'detour', but I remember that if you got too close to one of the other cars or needed to pass, you'd reach out and grab one of them to push yourself along or away from them. The trouble with the detour was it didn't follow the road we needed to take, the 'river detour' took a left fork and everyone had to go that way. When we got out of the water area, we were on a long hill surrounded by forest. I don't think we had a car anymore at that point, I think we were on foot. That road took us even further away from where we were supposed to be. When we finally reached a town, the people there didn't speak english but I looked for a place to buy a map to determine where we were and where we needed to be. Day 554 - Popovers for Breakfast?? I don't 'really' know what day it is, because on vacation EVERY day is a non-work-day. It is almost 7:30am and I just got up! Oh, sorry - here I go reminding you again how blissful my vacation life is. We are WALKING (for exercise and calorie reduction reasons) to a restaurant named 'Market Square' for breakfast this morning, leaving in about half an hour. The restaurant serves a giant popover with your meal, and since my mother knows very well that I LOVE POPOVERS, (as they are in the bread family) we're heading that way this morning. Do you KNOW what a popover is? Also known as Yorkshire pudding - 1 cup of flour, 2 eggs, 1 cup of milk, and a dash of salt, cooked at a high heat in greased muffin pans to make a puff, a little like the shell of a cream puff - only bigger. I have been known to make a recipe of popovers and eat the whole batch myself - which wouldn't be so bad if they weren't slathered with real butter. My mother and I attended a potluck dinner last night - it was especially fun because nobody brought an entree! There were several salads, one appetizer, one hot vegetable, two desserts, and two casseroles. My mother says the loaf pan of macaroni and cheese was an entree, but I disagree - in the south it counts as a vegetable. Gotta go get ready to walk to breakfast! TTFN and have a nice Tuesday! Day 553 - Hola! It's Monday! I'm at 'Mom 'n Gils' now after a fun retreat weekend at the ocean in Saco, Maine. My retreat weekend went very well, though the weather was very hot and humid , which is not fun with no air conditioning. They had just finished a week of very COLD weather, and I saw a staff member arrive on her bicycle one morning wearing a long sleeved t-shirt with a down vest over it! Only in Maine! Next year is our 10th anniversary of doing the reunion conferences. Ten years goes by fast! We did Tai Chi on Sat and Sun, and Sunday morning's Tai Chi was on the beach at 7am - glorious time of the day. The ocean was all in pastels yesterday at sunrise, periwinkle and lavender and pinks with a glistening sheen over it all. Too beautiful to capture with a camera. We decorated 'sugar eggs' for our arts and crafts project - Enchanted eggs in my terminology. These were sugar egg 'shells' with one end cut off to form a window. You decorate them with objects inside, then put the two halves together with icing and decorate the outside too. I'll post a picture once my pictures are downloaded (after vacation probably). Last night we visited with some of the aunts and uncles and cousins up at 'the farm', and ate pizza outside on the deck. The funny part about doing that in Maine is that most people put on a sweater or a jacket first! Ha! Have a great Monday and more blog tomorrow! TTFN! Day 550 - Vacation has begun! Coffee is brewing (Dunkin Donuts regular). Actually I'm drinking some now, with equal and 1.5% milk in it. Dinner last night - boiled lobster, corn on the cob, sliced tomatoes and cukes, cantalope afterward, and homemade chocolate chip cookies (yes, I had one). Mmmmm. It rained here overnight, I thought it was just my imagination to hear rain... Temp is 60 and it is supposed to turn hot and humid here for the weekend (just what I'm used to, go figure). Hopefully it won't be too hot at the ocean, where we're headed. We're picking up Aunt Nancy at the airport this morning, then heading to Saco Maine for the weekend on a 3-day retreat. We'll be having lunch at Huots restaurant in Camp Ellis, ME - where they have outstanding haddock chowder, the best I have ever tasted, and wonderful fried clams. I won't be blogging again till Monday, so have a wonderful weekend! I know I will! Day 549 - Vacation and Sporadic Blogging Notice! Yes, I am officially on vacation. YES, indeedy David. Feel the bliss! I will only be blogging sporadically for the next two and a half weeks. YES - TWO AND A HALF WEEKS. Last night at 10:15pm I logged into work to set my 'out of office' message on my email. That sounds official! My bag is packed, my clothes are rolled and put into plastic bags - I've never done that before so I'm experimenting. Hopefully I have remembered everything - if not - call it a shopping opportunity! I need to make myself a lunch for the plane, and I have a vampire book to read on the way. By the way - I am changing planes in Philly, and will try NOT to eat a big fat greasy cheesesteak while I'm there. Charlie is driving me to the airport - Thanks, Charlie! Mom and Gil have ordered lobsters for supper tonight - can't wait to get there! Thanks, Mom and Gil! TTFN folks! Love you bye! Day 548 - Last Day of Work till Vacation! I just finished packing SOCKS in my suitcase, I realized I hadn't put any in. Oops. Last night I had to fix up a few things to mail before my trip too. I have a lot of last-minute stuff to do, and I haven't chosen what book to read on the plane. Big decision! I want to read that 'Twilight' vampire series by Stephanie Meyers that's so popular right now. I'll bet the bookstore doesn't have any, but I may go over there at lunchtime today. Work today is Wrap up, wrap up, wrap up and transition. Big fun! Hey! Did you hear that a BLIND GOLFER hit a hole in 1 in Pennsylvania? Good grief! Hey again - it's quarter past 6 already so I'd better go. TTFN! Have a wonderful Wednesday, and then I'm on vacation!!!! Day 547 - Vacation Day After Tomorrow! I am getting ready 'fer' TWO weeks off, plus TWO days! Contemplative thought of the day - why are we always late when alarm clocks are always on time??? I thought of that this morning at 5am and told Charlie... He is so nice to listen to me at that hour! Thank you, Charlie! Did I tell you we bought a 'cyclonic' style vacuum cleaner this past weekend? Our old one bit the dust. We bought a Bissell Velocity vacuum, and also a little rechargeable broom vac for the kitchen. I haven't used either one of them yet. I might go try the broom vac right now, but I need to get ready for work! Several years ago I bought a carpet cleaner. I haven't used it yet. Enough confessions! Gotta go to work! Day 546 - Three more days till vacation! Today and the next few days will be 'catch up' on whatever I can get accomplished, and handoff of responsibilities to various folks in my absence. People to sit in on meetings for me, people to take on tasks that need to move along, who's doing what, etc. I'll have a lot of assignments to do before I go. Suitcase status? About half packed with the other half laid out on the bed waiting to be packed. What was perfect? Nicole's ex-husband had turned into an evil alien - what woman hasn't felt like THAT has happened? Ha! Cracker Barrel tonight with TY and SY. Can't wait! TTFN folks and have a nice Monday! Day 545 - Sunday before vacation! Greetings, Blogregation! It's Sunday! I hope you're having a great weekend! I'm already drinking my foame' latte' that Charlie made for me, have a wash in, spotted wild turkeys in the yard and Charlie took pictures of them, and packed a few things. Yesterday I went to water aerobics, then went into work for a couple of hours (due to that problem we had overnight), then went grocery shopping, then cooked dinner, etc etc. No time for 'da blog'. Charlie and I are BOTH going to hit the health club later this morning, then go see Nicole Kidman's 'Invasion' movie. I don't care if it's predictable, I like those kinds of movies. Hey Ross-man - you were in one of my dreams last night. You needed some kind of driver or service routine written. My witty suggestion was to write it in COBOL. See, I can even be funny in my dreams! Joe -please tell Ross I mentioned him on 'da blog'. Another former co-worker (nameless) was in one of my dreams last night, and had a citation for DUI in her hand. She had her 15 year old niece with her too, who was busy throwing up. Where did THAT come from? Anyway - gonna go make breakfast! TTFN and have a nice party for Will today! Day 544 - No time to blog! No time to blog this morning, I had an issue with the overnight jobs at work, and now I need to go out the door to water aerobics. TTFN and Welcome Home to William! Day 543 - The Friday before Vacation! 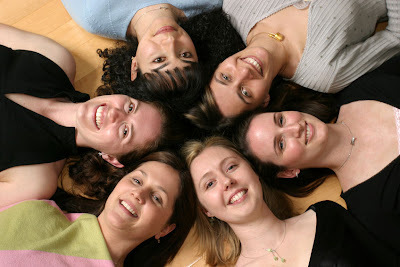 Greetings, Bloggy Weekenders! It's FRIDAY already! I love the photo today - these kids are awesome. Check out the various expressions on their little faces. Hilarious! It was 106 or so yesterday, but the good news is that around 9 or so last night, we suddenly heard this NOISE outside! The noise was RAIN! It was a stray, popup shower that decided to bestow some life-giving rain on us for a few minutes. We looked on the radar, and didn't see that anyone else got any rain. I'm very thankful for every drop. Temps over 100 expected again today, it is already 82 degrees before 6am. I have had a busy week at work, and look forward to the weekend to do my packing for vacation! I still need to decide what to bring to wear - stuff for warm AND cool weather is appropriate for New England! Hey! My fave Sabra won the 'Think you can dance' championship last night - awesome! Gotta go - have a nice weekend everyone! TTFN! Day 542 - I live on good soup, not fine words! 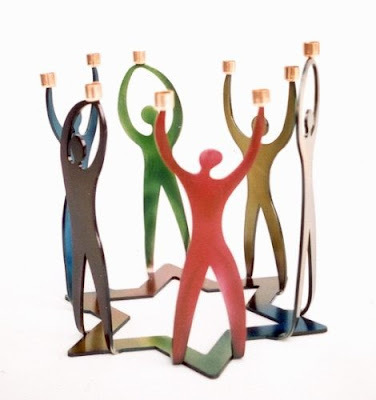 Greetings, Bloggy Articulates! How are your vowels feeling today? 'I live on good soup, not fine words' is a quote from Moliere, a french actor and playwright. Water aerobics at 6 tonight, and I might just get subway sandwiches for supper or salads or something. Only four short business days after today to wrap up everything I had hoped to accomplish before I leave on vacation. Sounds kinda skimpy at the moment, doesn't it? Is anyone watching the 'Think you can dance' show? My faves - Sabra and Danny. I even voted for Sabra, and I've never voted for anyone on those shows. Their Cha-cha-like dance last night was great. Day 541 - Midweek and ONE WEEK TILL VACATION! We are still having weather here in the 100's. It is unreal! Too hot to 'lay out' at the pool. I tried to 'lounge' after my swim yesterday, and the metal on the lounge chairs was so hot it burned my feet! I am sitting here, blogging, with a cup of coffee (foame' latte' that Charlie made for me) on one side of the computer, and a quart mason jar of ice water on the other side, practicing my 'hydration exercises' (meaning, drinking something). I just finished slathering hand lotion on myself too - it is hot, dry and uncomfortable here! The weather.com website says 104 for the high here today. Yuck. It is already 72 and will climb fast once the sun comes up. I think this has been the hottest August on record here. Hey - have you noticed how the days are changing? We get up at 5, and the sunrise isn't until after 6am! More Yuck. The good news - ONE WEEK FROM TODAY is my last day at work until after vacation! Wahoo, it really is almost here! I'd better start packing! I have my brandy-new suitcase on the guest bed with some stuff in it already, and lots to add. I started a packing checklist on the computer too. Note to self: hope I remember to look at the checklist! By the way, today is the fifth anniversary of Charlie and I moving out here to the country. Happy Anniversary, house! We love it here. Day 540 - Hand me summa dem yeller carrots! Apologies for the slightly fuzzy photo of these YELLOW CARROTS! Charlie and I have been having these as lunch snacks this week. I have had such a craving for yellow and orange vegetables - for months, in fact. This includes squash and parsnips and turnips and carrots and lots of sweet potatoes. Have you seen these before?? I hadn't, and went to the Publix grocery store this past weekend, and spotted them. The produce guy said 'I haven't tried them yet - let's see what they taste like!' and tore open the top of the bag on the spot! (I would never do that, but he could). He reached in and grabbed one, and I did too, and we happily munched on our Yellow carrots... and guess what? They taste exactly like orange carrots. A miracle of gardening prowess. However, I do think they will be beautiful WITH orange carrots on a vegetable tray, and they certainly caught my eye. 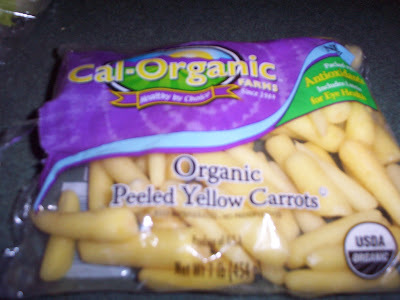 So, the bottom line is - for $2.49 a bag, YOU TOO can enjoy yellow carrots... that taste exactly like orange carrots. Day 539 - Monday, but Evan's birthday! Today is my son's birthday - I will discreetly NOT say which one. The photo of Pooh's birthday is because Heather always calls him 'Pooh' or even 'Pooh-per'. Evan doesn't usually read the blog, but the rest of the family does, so HAPPY BIRTHDAY, EVAN! At the age of three - 'Heather, do you think I'm handsome? (She said Yes) WHERE am I handsome?'. (Heather told him he had nice hair). Evan's favorites - Near East Rice Pilaf, Iced Coffee, Steak a la Mama, the ocean. 'Mom, why didn't you name me Kevin? Everyone calls me Kevin anyway'. 'Mom, you're a wicked pinhead'. Have a great birthday, Evan, and the best year ever! See you very soon! Day 538 - Sunday is Funday! We had a cold snap yesterday, it was only 99 rather than 100 or above. Today is also expected to be 99 degrees. We had an excellent day yesterday - water aerobics in the morning, Amish country in the afternoon, and Papa Boudreaux's for supper. Joe and I had seafood gumbo, and Charlie had the colossal boneless chicken breast with andouille sausage and cajun cream sauce over linguini. We also managed to force down some delicious blackberry cobbler with vanilla ice cream for dessert. We all crashed in the den in our various recliners after that HUGE meal and had a nice long nap. We didn't buy a single vegetable in Amish country, as all they had for sale were tomatoes and cantalopes and watermelon - pretty much the same vegetables we were able to grow this year. We saw lots of wilted plants that would have produced a nice crop of peppers IF there had been any rain. What a shame. We just had bacon-egg-cheese-and-garden-tomato sandwiches on Amish homemade wheat bread, and Charlie and Joe are going boating while I am at the pool. Have a nice Sunday, everyone! TTFN! Buddy Joe is spending the night tonight after a trip to Amish Country and Papa Boudreaux's Cajun place. I've had two bags of stuff sitting in the guest room that I've needed to bring to Goodwill. As I needed to clean up the guest room, I decided to do that at my lunch hour yesterday. I dropped off the bags (mostly clothes and shoes) at the Goodwill drive up area, then parked and went inside for a few minutes. BOY AM I GLAD I DID! 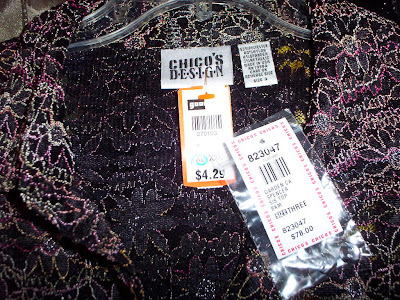 I am now the proud owner of a Chico's Design knit shirt that is NEW WITH TAGS. The tag reads $78, and I left the Goodwill tag on it so you can see I paid $4.29 for it. OH YES! LIFE IS GOOD! And of course it is lovely, it is washable and it fits perfectly! I wouldn't want to leave that part out. I am definitely bringing it on vacation in 2 weeks. I have so many Chico's clothes now I could wear something every day of the week. And I never paid retail or store price for any of it. Thank you, Chicos and Goodwill! TTFN! Gotta go swim! Day 536 - It's FRIDAY-licious! Friday has rolled around again. My work day yesterday was from 7am-5:40pm, I barely made it to 6pm water aerobics. Water aerobics was fun; there were 4 other participants, plus me, and the instructor. A good sized group. A new and difficult exercise we did yesterday. We have hand-held weights that look like two round pieces of styrofoam on either end of a stick. We needed to swim from one end of the pool to the other using the weights instead of our hands, with the overhand crawl stroke. Talk about shoulder and arm and leg exercise... I had water shoes on too, and the instructor said to swim with the aqua shoes on adds another 5lbs of resistance. Anyway, I'm not sore so it was just right! Have a great Friday and weekend everyone! TTFN! Day 535 - It's 102, What Knit Winter Hat Should I Wear? Greetings, Bloggy Back to Schoolers! So, what color skull cap will your child wear today, IN THE SUMMER? Some schools here are already back in session, and the kids waiting for the bus are fun to look at when I drive by. I passed a kid up the street who was wearing a short sleeved, black and white striped shirt (like a mime), suspenders (like a mime), blue jeans, and a ridiculous gray winter hat pulled down almost over his eyes. ABSURD. I laughed out loud as I went by. 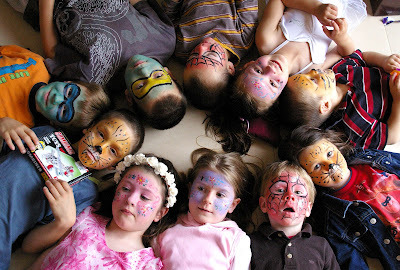 This photo, by the way, came up when I searched for school and skull caps. 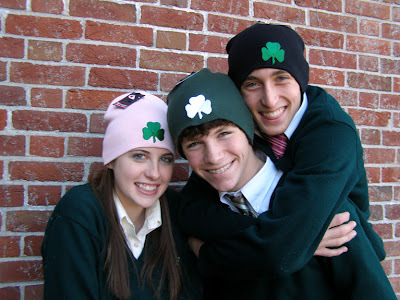 The funny thing about it is that the kids and caps are from Bishop Feehan High School in Attleboro, MA! Attleboro is 'two towns over' from where I used to live, and where I used to catch the train into Boston. Have a great Thursday, everyone, and stay cool! Day 534 - Midweek, Midlife, and Bloody Hot! It's Wednesday, and the week is (now) flying by. So what will the temperature be there TODAY, Karen? ONE HUNDRED AND TWO, with a heat index even hotter than that. So what was the temperature in the outdoor pool yesterday, Karen? NINETY-FIVE DEGREES, bathwater temperature. So were any brave souls IN the outdoor pool yesterday besides YOU? YES! As a matter of fact, there were 6-8 other crazy people outdoors in that heat. So, are you eating cantalope (or cantaloupe) at every meal? YES! Charlie has it with breakfast, I have it with my lunch, and we both have cantalope for dessert. Gotta go, folks! Have a great Wednesday! Day 533 - Whatta Melon! 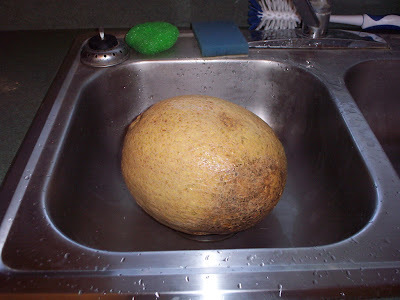 This is a photo of the cantalope Charlie brought in from the garden yesterday. OMIGOSH. The &^%$# groundhog was starting to nibble on it so we knew it was ripe! Tough luck, groundhog, it's OUR FOOD. THIS MELON IS AS BIG AS THE WHOLE DARN KITCHEN SINK! ENORMOUS! SPECTACULAR! I sliced half of it into a half gallon tupperware container, and the other half into another half gallon container to bring to TY and SY when we met at Cracker Barrel last night. It is absolutely delicious, I have some in my lunch bag to eat at work today. I should have weighed it before I sliced it - it weighed several pounds! It'll be another 100 degree day today. Gotta go swim after work, if it's too hot outdoors I'll have to swim inside! Have a nice Tuesday and TTFN! First - an apology to Lyn for not having done a 'church sign' posting yesterday. Second - I have my new luggage, I am ready for my vacation! I bought it at Belks department store in Columbia. I had never been to a Belks before, but I saw in their Sunday flyer that luggage was on sale. You just won't believe what I paid for it. 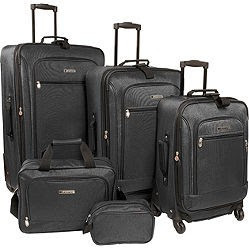 It isn't a fancy name brand but it has those 360 degree 'spinner' wheels on it that help your luggage roll in any direction, and it's made of a durable material. Those two things are what I cared about. I looked at 'nested' sets. I brought 2 sets to the register because we couldn't tell what the price was! One was a 4 or 5 piece red set from Regal, and the other was a 5 piece from Leisure. Both sets (it was my understanding) were on sale for $99.99, but I wasn't sure. Anyway - Charlie rolled up one set and I rolled the other to the checkout place and I asked a nice (but no personality) young man to do a price check on them. The red set was on sale for $99, what I expected. He acted like he was offended that I didn't believe him and turned the computer monitor toward me. I said 'I'll take it!' and started fishing in my wallet to pay for it before he decided he'd made a mistake. He said it was a closeout and was on sale for 70% off. AND for tax free weekend there wasn't any tax on it! I couldn't be happier. Day 531 - Still no time for bloggage! It's 8am and I need to go swim before it gets any hotter. Yesterday was 98 for sure, and it might have been hotter than that. Every day this week is supposed to be 97 or above. Have I mentioned that is unbearably hot? You just have to walk slowly because it is so oppressive. Charlie's watch is working after a spin in the washing machine yesterday (it was in his pocket but he retrieved it before too long). I stewed down some of our tomatoes into spaghetti sauce yesterday - half a day's labor for three containers of sauce sounds like a lot of work, doesn't it? Sheesh. However, sauce from a jar can't compare, so I should say it's worth it! Day 530 - No time for bloggage! Hi and Bye, Bloggy Dearests! Gotta go out the door to water aerobics, then shoppage and tomato wrestling after that. Day 529 - OMIGOSH it's Friday! The week has flown by, actually. It's been mid 90's every day here. That is bloody well hot. No rain, of course. The outdoor pool at the health club was almost 90 degrees yesterday - the warmest outdoor pool temp since I started going there. Usually it's 82. My manager mentions (almost every day now) how much she's going to miss me during my upcoming vacation, and I think she means it! TWENTY days from today folks, I'll be flying off to Maine. Bliss, pure bliss. Tennessee tax free weekend starts today! This is primarily for back-to-school shopping. Gotta go partake of some non taxable items like clothes (that are tax free all the time in some other states). Swimsuits are classified as clothing, so I might do some shopping for swim stuff. What I really need before my trip is a new suitcase. I tried to order one on the web and my transaction didn't go through. I tried it several times, then gave up. I think fate was telling me not to buy that bag. Okay, but what am I going to pack in then? Day 528 - Thursday already! It's Thursday already! I can't believe how this week is flying by. 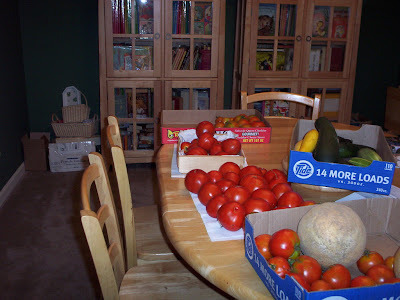 Today's photo is of the 'harvest' on our dining room table - what abundance! There's another batch of salsa sitting there and stewed tomatoes and salad tomatoes - that has to wait for the weekend. 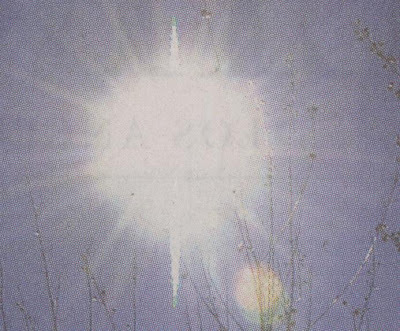 Can you see the cantalope? Charlie GREW that - it's as big as a commercially grown melon! We've already eaten one of them and it was delicious. The squash and cukes are about gone now, but the melons and tomatoes (obviously) are coming in by the bucketfull. I had a hungering for winter vegetables, and stopped at the store (Kroger) to get some frozen mashed butternut squash (because I was too lazy to buy one and cook it and the last one I bought cost FIVE DOLLARS). Do you know that Kroger doesn't sell it frozen in those little squares? I know Publix has mashed squash and mashed turnip, I'll need to stop there. Sheesh. So - does anyone but ME crave yellow vegetables all the time? I really do - must be some vitamin I need, because I crave turnip and parsnip and winter squash a lot. Gotta go - have a nice Thursday! Day 527 - Happy Birthday, Bro! I have no time to blog this morning because of an issue with our overnight jobs that run at work. I'm just saying 'good morning' and HAPPY BIRTHDAY TO BRUDDA-IN-LAW!